The innovatively designed sheets give an even flat cutting surface and save precious installation time, filling a bed in seconds.Rhino Board’s polypropylene honeycomb core sheets are comprised of cylindrical polyolefin tube straws bonded into a close packed hexagonal matrix to produce a low bulk density core material. As the main UK distributor, we stock a variety of sheet sizes and can also cut to specific requirements. Simple & Fast – Rhino Board eliminates having to build a bed out of smaller bricks which is time consuming during setup and removal. 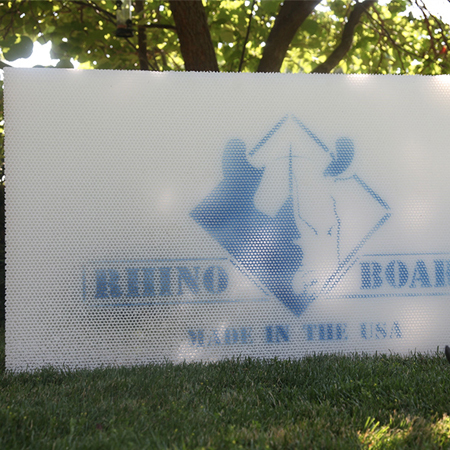 More Durable – Rhino board will not fall apart – there are no screws used due to the patented bonding process, making repairs to the Rhino Board possible with a simple hot glue gun. Environmentally Friendly – Rhino Board creates less polypropylene residue in the water tank, reducing cleaning operations and maintenance, saving you time and money. Rhino Board can be recycled.